I was recently asked to prepare a recipe for the Texas Beef Council's Back-to-School Nutrition Experience. I was thrilled to do so, as I think nutrition is very important. Plus, supporting the Texas Beef Council is something I am always more than willing to do. If you've never been to their website you should really click over and check it out. It's full of amazing recipes and all sorts of useful information. I prepared After Work Beef Pot Roast for my family. We all love roast and I especially like recipes that are easy to prepare and toss in the slow cooker. Dan was somewhat skeptical about the recipe; it has zucchini in it and he was pretty insistent that a good roast should only contain potatoes, carrots, and onions. He ended up eating his words! The whole family really enjoyed this dish. 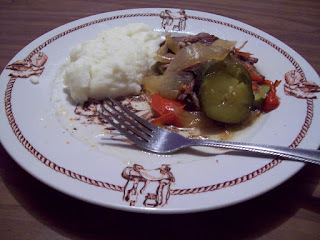 Although it is a lot different than my traditional pot roast, it was delicious and fall apart tender. It was easy to put together, which is a big plus with me. You could easily prepare it, pop it in the slow cooker, then come home to a wonderful dinner with very minimal effort. The flavor was fantastic! They all loved it so much that it's already been requested again! I think this one is a really winner! Go check it out, along with all the other yummy sounding recipes the Texas Beef Council has to offer. This post was written for the Texas Beef Council as part of their Back-to-School Nutrition Experience.